The sun was out on Saturday morning so I took to the long river loop. Goldcrests that have been the bird of the winter on the patch were completely absent and I began to wonder whether they were already working their way back to Siberia. I kicked up a couple of partridge on the way to the river and logged my first goosander of the year, flying on rapid wing-beats toward Morton-on-Swale. The river has been quieter than normal, but the patch first of two little grebe a couple of weeks ago was followed up by the sighting of a solitary bird about 1km upstream. They're very cryptic and I wonder whether I've just blundered by them in the past. Each year I've lived here, my first skylark sightings have come at the same place and this year was no different... two birds were singing at the NW-most bend of the river loop. Another sign of Spring, male lapwings have begun to hold territory in Thrintoft Ings. It feels like it's going to get colder before it gets warmer but I love how the seasons aren't defined, but instead feather together. Fields that were laid to stubble last year are unusually covered in grass and alas the bunting and finch flocks cannot be found. I wondered up to the great hedge opposite the large ox-bow hoping to tick off linnet, redpoll, corn burning or brambling but none could be found. 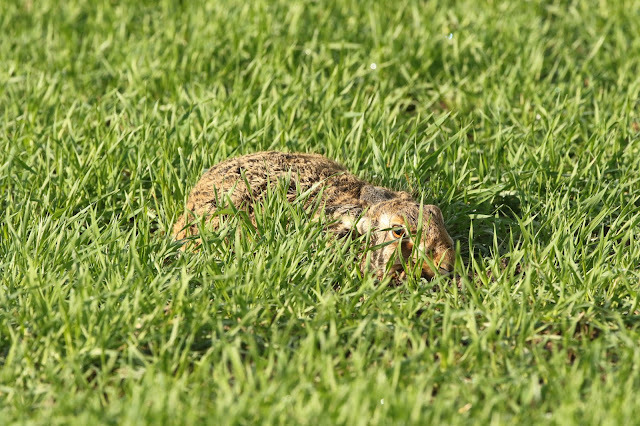 Instead, I spotted a hare lying in its form in the field. From a hundred yards or so I edged closer and closer, camera held to my face. I find that hares react in two ways: they either bound slowly away at the first sight of me; or they hold their ground until I'm close before bolting at great speed. The hare above did the latter (the image above isn't cropped) allowing me within 20ft. It wasn't until I looked away and looked back that it was on it's heels and in the blink of an eye, 200 yards away. Other mammals were obvious this weekend too; badger prints led out on the path from Thrintoft and otter tracks and slides were obvious on the far river bank opposite Scruton. Roe hoof-prints are everywhere and I even saw my first pygmy shrew in ages... the last one running up my leg whilst I sat in my hide a couple of years ago.